2012 is the 40th anniversary of the passage of Title IX, which gave women equal opportunity in education and sports in most colleges and universities. There have been numerous articles recently written about the successes of women athletes because of Title IX. However, nothing has been noted about the fight for this civil and gender rights. 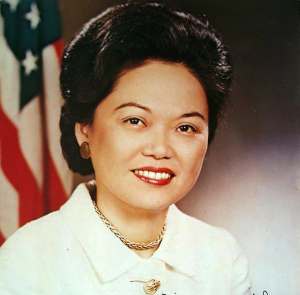 One woman who fought doggedly and passionately advocating women’s issues in Congress, including gender rights, was Patsy Takemoto Mink of Hawaii (1927-2002). She garnered critical support for the passage of Title IX at a time when there were only eight women who were members of Congress. She felt a special burden to bear to speak for all women because they didn’t have people who could express their concerns for them adequately. Rep. Patsy Takemoto Mink during her second tenure in Congress. Mink noticed inequality from her early youth between the white people who owned the islands’ plantations and the plantation workers, who were mostly Japanese and Filipinos. She further experienced more inequality and injustice when her father was taken in for questioning after the bombing of Pearl Harbor on Dec. 7, 1941 because of his Japanese heritage, even though he had been born in Hawaii. Mink was class president and valedictorian when she graduated Maui High School at the age of 16 in 1944. She enrolled at the University of Hawaii, intending to study medicine. She received her B.A. in zoology and chemistry. Her applications to over 30 medical schools were all turned down, not because of her grades, not entirely because of her Japanese American heritage, but mainly because of her gender. Therefore, Mink was forced to change the profession by which she could be of service to her community. She was admitted to the University of Chicago Law School. In 1951, she married John Mink, who was attending the same university, studying geology. In 1953, when their daughter, Gwendolyn Matsu Mink, was 6 months old, the family moved to Honolulu. She again ran into sexism when no law firm would hire her. So she opened her own tiny law office and taught business law at the University of Hawaii to supplement her income. Mink’s career path changed when she became involved with the Young Democrats. She enthusiastically organized the Young Democrats in Hawaii and was elected national vice president. In November 1956, she was elected to the House of Representative for the Territory of Hawaii. In 1959, she was elected to the Territorial Senate. That same year when Hawaii became the 50th state, she decided to run for Congress, but was defeated by a war hero, Daniel K. Inouye. In 1964 she again ran for the U.S. Congress and won, although she did not have the blessing or financial support from the state Democratic Party. Mink was the first woman of color to serve in Congress. She served six terms until 1977 in her first trip to Washington. In the first days of her first term, she and a few others protested the seating of the representatives from Mississippi to demonstrate opposition to the voting practices in the state, which excluded African Americans. Mink took an interest in more than 60 programs in the “War on Poverty” from 1965 to 1967. Some of her greatest efforts were in the area of education. She wrote bills for the benefit of needy children from pre-school through college and succeeded in getting many of them passed. Patsy Mink in the 1960s. Mink’s objection to G. Harrold Carswell’s nomination to the U.S. Supreme Court based on his sexist beliefs resulted in the Senate turning him down. In the fall of 1973, she asked Congress to begin the impeachment process of President Richard Nixon so that the American public would finally know the truth of his actions. In 1971-72, Mink ran for president in order to make Americans consider the possibility of a woman president. She was on the ballot in Oregon under the Green Party. In 1976, Mink again decided to run for the U.S. Senate, but was defeated by another war hero, Masayuki “Sparky” Matsunaga, who could be counted on to stick to the party line. She was too much of a maverick. She was unwilling to allow the party to influence her political agenda. She served as assistant secretary of state for oceans and international environmental and scientific affairs from 1977 to 1978. For the next three years she was president of Americans for Democratic Action. 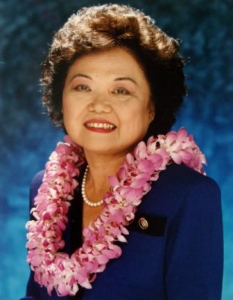 She was elected to the Honolulu City Council and served from 1983 to 1987. She ran unsuccessfully for governor in 1986 and for mayor of Honolulu in 1988. When Sen. Matsunaga died in office in 1990, Rep. Daniel Akaka was appointed to fill his Senate seat. Mink won Akaka’s House seat in a special election, and served until her untimely death on Sept. 28, 2002 after a month-long hospitalization with pneumonia. Back in Washington, she picked up on the same issues she dealt had with before. She and other women of the House demanded an investigation of Supreme Court nominee Clarence Thomas, who had been accused of sexual harassment. She also continued her earlier work for the rights of Native Hawaiians and others of Asian Pacific descent. Mink had an illustrious, if contentious, political career. She served in Congress from 1965 to 1977 and again from 1990 to 2002. She sat on the Committee on Education and Labor, Committee on Interior and Insular Affairs, Budget Committee, Government Reform Committee, and others. She introduced or sponsored many bills. Among the education acts she supported were the first child-care bill and legislation establishing bilingual education, student loans, special education, and Head Start. Although she supported many of President Lyndon Johnson’s domestic programs, she was a critic of the Americanization of the Vietnam War. In September 1967, she refused to support the president’s request for an income tax increase because of her fear that the new revenues would be used for military action rather than the expansion of social programs. However, one of her greatest legislative triumphs, and one that she is most closely associated with, is authoring and garnering critical support for the passage of the Title IX portion of the Education Amendments of 1972. It is now referred to as the Patsy T. Mink Equal Opportunity in Education Act. Because of her persistence, passion, and leadership, women of today enjoy participation in competitive sports such as basketball, volleyball, track and field, swimming, tennis, gymnastics, and others. Sept. 28 is the 10th anniversary of her passing. We should all pause to remember this courageous trail-blazer, who, like many other civil and human rights leaders, made a difference in all our lives and our children’s lives. Robert Moriguchi is a resident of Granada Hills and a volunteer at the Japanese American National Museum. Opinions expressed in this column are not necessarily those of The Rafu Shimpo.